I loved the tension in this film. Because of the constant silence, you feel every second of this film and it becomes as tense as a movie can be. Especially the middle part of the movie grabbed my attention and didn't let go for one second. The only 'flaw' is the solution they find at the end. I think this is so logical, it's almost a plothole. I thought of using sound 20 minutes into the film and it's so simple, so logical, I think everyone did. A nice little innovative addition to a genre I rarely enjoy. It helps that I find Krasinski insanely likeable. Fascinating concept, but just... lacklustre. Boring in places, sure, but in general the ending really feel like it lacks a point? It isn't even just nihilism, but just that sense of valuelessness, etc. Big disappointment. A Quiet Place'de bulunan, Alien ve The Thing'e benzer yaratıcı fikirler ebeveynlerine göre farklı gözüküyor ve düşük bütçesiyle göz boyayabiliyor ama tüm bunlara rağmen kendi türüyle karşı karşıya gelip büyük bir kavgaya tutuşarak hiçbir şekilde germeyi başaramıyor. In a world almost completely depopulated by blind monsters with super sensitive hearing, a family struggles to survive in utter silence. It's an intriguing if utterly ridiculous premise (no one in this family ever sneezes or farts, apparently), but the film's internal logic is consistent and the acting performances are universally solid. The trick that they eventually used to defeat the monsters seemed really obvious though, so it seems pretty unlikely that no one thought of it for so long. A Quiet Place is the biggest surprise of 2018 and the best horror film in recent memory. John Krasinski excels on both sides of the camera and his direction and writing is impressive throughout. 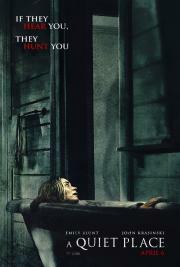 Emily Blunt is superb and she brings such an emotional weight to this film. Whilst child actors Millicent Simmonds & Noah Jupe are both revelations. The lighting and sound design is absolutely stunning and I found the concept so refreshingly simple. This is such an atmospheric and compelling experience. Well executed original concept, good acting. All I see is bearded Jim.